When it comes to sports, few comic characters make such a statement (or intimidating threat) as 'The Unstoppable Juggernaut'. Charles Xavier's step brother and Onslaught's infamous punching bag, Cain Marko has been an unbeatable force in comics for years. Now that's some heavy-duty punishment! 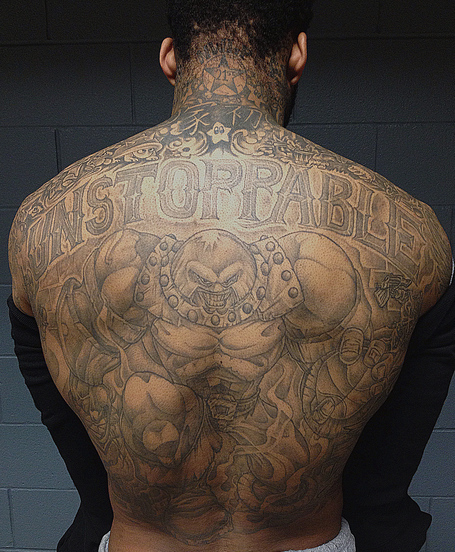 Speaking to Denver Stiffs about this mammoth back tat, Wilson states going 1-for-naught wasn't his first thought when getting his tattoo artist Reggie Tatz to do a Marvel character. "I was a real big fan of X-Men. Growing up I used to watch it a lot. I was trying to think of a great tattoo that I could get and mix it in with basketball. At first, I was thinking Wolverine. The idea [of the Juggernaut] came from my tattoo artist. This was when I was healthy and before all the surgeries; I used to go to the rack pretty hard. He was like, "You should get the Juggernaut" because they called me Unstoppable Juggernaut, so I thought that'd be kind of cool." What do you think? For more of Wilson's tattoos, including Kenny, He-Man and more, click here. To visit Reggie Tatz's gallery, click here. I think I like this one better than some of the full color ones I've seen. That's stunning, really quite remarkable. And its refreshing somehow that, for a change, someone gets a tattoo of a comic-book character who isn't known outside the comics medium generally. I agree Karl, I've trawled the internet for some cool tatts of some pretty sweet characters, both conceptually and visually, but to no avail. Seeing Juggy like this (and as Random points out) kinda renews your faith huh? I'd die if my husband arrived home with that tattoo! Are you hoping Aliera your hubby will read this and get your subtle hints, then go get one? Very sneaky!! Damn - looks like I'm going to have to find a new topic for todays post then!